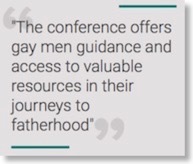 With record breaking attendance at 240 people, the 5th annual West Coast conference by gay parenting organizations Men Having Babies and Our Family Coalition was held at the Marines’ Memorial Club & Hotel on January 13-14, 2018. It featured community resources and twenty-eight service providers from the USA and Canada, as well as information about financial assistance for prospective gay parents. Men Having Babies (MHB) is a non-profit organization, led by parents and surrogates, that has been helping thousands of gay men worldwide become biological parents since 2012. For the fifth year in a row it is partnering to host its West Coast conference with the San Francisco based Our Family Coalition, an organization that promotes the equality and well-being of LGBTQ families with children. The two-day conference brought together community activists, medical and legal experts, parents, and surrogate mothers. 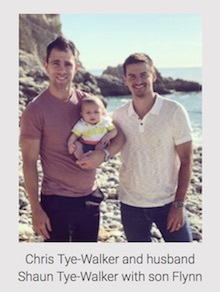 Prospective parents benefitted from practical and personal peer advice, and were given the opportunity to meet with a wide range of leading providers from the USA and Canada at the Gay Parenting Expo, in breakout sessions and in private consultations. The conference kicked off with a panel discussion comprised of gay surrogacy dads and the surrogates who helped them in their journeys. Two workshops were offered on planning the surrogacy journey and choosing providers, based upon the accumulated knowledge of hundreds of gay men who have already gone through the process. Other sessions covered a wide variety of topics ranging from the latest studies about gestational surrogacy, insurance, budgeting, legal, medical and psychological aspects of surrogacy. The San Francisco conference is one of six annual conferences held by Men Having Babies worldwide, with other conferences planned for 2018 in Austin, Chicago, Miami/Fort Lauderdale, Brussels and New York. Proceeds from sponsorships and exhibiting fees benefitted Our Family Coalition and MHB’s Gay Parenting Assistance Program (GPAP), which annually provides dozens of prospective parents with over a million dollars’ worth of cash grants, discounts and free services from more than fifty leading service providers. Over the last 3 years, this program has helped more than 500 couples and individuals achieve their goals of becoming fathers. “If we truly wanted to make a difference by establishing Men Having Babies, we knew we had to help prospective parents financially achieve their dream of starting a family, and the GPAP program does just this,” said Anthony Brown, MHB’s Board Chair. “We want to give the opportunity to people who would otherwise not be able to afford surrogacy”. The majority of the 28 exhibitors at the San Francisco conference are supporters of the Gay Parenting Assistance Program, including platinum sponsors San Diego Fertility Center and International Surrogacy Center, as well as Gold sponsors: Creative Family Connections, Oregon Reproductive Medicine, California Fertility Partners, WorldWide Surrogacy, Same Love Surrogacy, HRC Fertility, NW Surrogacy Center, Colorado Center for Reproductive Medicine Create Fertility Centre, Pacific Fertility Center, and Family Source Companies.